With warm, mild weather and plenty of fun events to kick off the festival season in New Orleans, April is a great time to plan your trip to the Big Easy. It's the perfect time to explore the city's many outdoor attractions, which will be fresh with spring blooms, but it's also one of the busier times for huge celebrations like Easter parades (depending on the year) and the French Quarter Festival. As a result, you may also run into unseasonably large crowd sizes, depending on what time of the month you plan your trip, and you should book your accommodations and flights well in advance to get the best deals on your travel itinerary. The average temperatures in New Orleans are some of the mildest weather you'll find in the Big Easy year-round. Humidity levels are also at a low, ranging between 45 and 75 percent for most of the month, but the weather can be a bit unpredictable in terms of sudden rainstorms. On average, New Orleans gets between four to five inches of rain over seven days in April each year, so you should come prepared for mild to heavy rain no matter when you visit this month. Because the weather is very comfortable, you can get away with packing typical walking-around clothes like jeans, t-shirts, and tennis shoes. However, you may also want to bring a sweater or light jacket for the evenings when the temperatures drop. Pack an umbrella and light raincoat just in case of a sudden storm. If you plan on taking part in one of the festive events or parties happening across the city this month, be sure to bring an appropriate costume—this city loves visitors to show off a bit of flair! 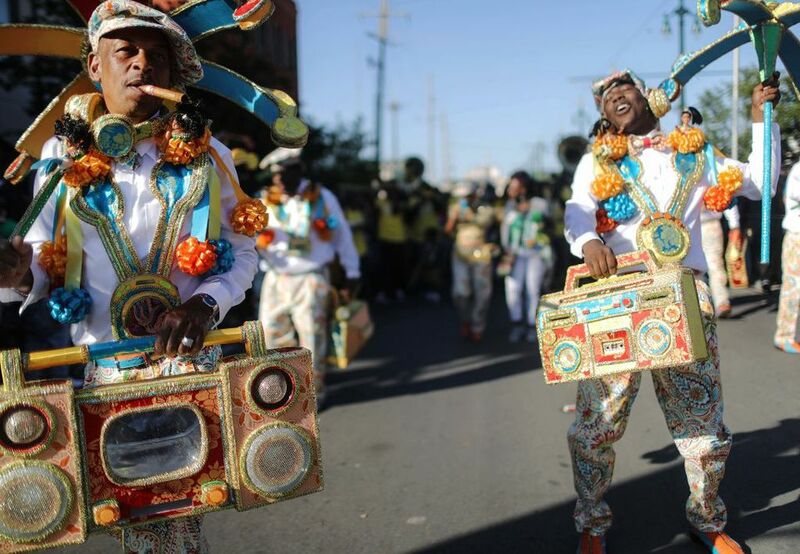 The best and most popular events this month are the French Quarter Festival and New Orleans Jazz & Heritage Festival, which both draw large crowds to the city. Although these big events will drive up prices on airfare and accommodations, April is still a wonderful time to visit, and there are plenty of other events for you to enjoy if you want to escape the bustling French Quarter for the start of festival season in the Big Easy. Wednesday at the Square: From March through May, you can enjoy free weekly outdoor performances in Lafayette Square on Wednesday nights for this annual spring concert series. Guests are encouraged to bring a chair or a blanket and sit on the ground or head to the front of the stage to dance. Performances include some of New Orleans' most famous brass bands, as well as a wide variety of local performers playing jazz, rock, funk, swamp pop, Latin rhythms, and many more musical styles. Crescent City Classic: Since it began in 1979, the Allstate Sugar Bowl Crescent City Classic 10k road race has grown to become Louisiana's preeminent fitness event and charity fundraiser, which draws over 20,000 spectators a year. French Quarter Festival: This four-day event highlights the unique food, music, and people of the most famous section of New Orleans. The event is made possible by the American Federation of Musicians, New Orleans Local No. 174-496, the Music Performance Trust Fund, and more than 150 dedicated sponsors and features local musicians performing throughout the weekend. New Orleans Jazz & Heritage Festival: Over two weeks in late April and early May, music fans pack the streets of the Fair Grounds Race Course & Slots for this annual event. The music begins at 11 a.m. each morning and ends by 7 p.m. each night, which allows visitors to venture to Bourbon Street for a taste of New Orleans nightlife afterward. Easter Parades: New Orleans' Catholic population is one of the biggest in the country, so it's no surprise that the city makes a big celebration out of its Easter parades. The first of the day is the Historic French Quarter Easter Parade, which starts before local church masses (around 9:45 a.m. until 11 a.m.); the Chris Owens French Quarter Easter Parade immediately follows the event. The final and most colorful parade of the day is the Gay Easter Parade, which usually starts before 5 p.m.
Spring is peak season, so you'll find airfare and accommodation prices tend to rise significantly, especially closer in time to the annual events. It's best to book several months to a year in advance to get a more affordable room and flight. Traveling in the spring means you'll get to see some truly remarkable parades, so don't let the holiday discourage your travel plans. Easter and the French Quarter Festival aren't quite as popular as Mardi Gras in the city, you'll have a better chance to experience the culture, music, and people of New Orleans during these events.